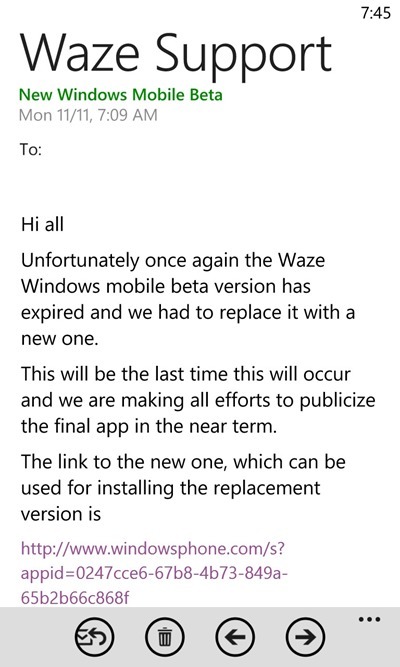 Good news to Windows Phone users, it looks like Waze will be heading to your devices “in near term”. Back in April, Waze announced that they were taking beta testers for an upcoming Windows Phone version of the app. A lot has happened since then like Google’s acquisition of Waze, but it looks like nothing will stop them. According to some beta testers of Waze for Windows Phone, the last beta is being released and the final version will be publicized “in near term”, hopefully very soon. The tester received an app invite for the beta tester program, which wrote “this is the last time this will occur and we are making all efforts to publicize the final app in the near term”. So Windows Phone users, Nokia Here Maps and Waze, which would you prefer?